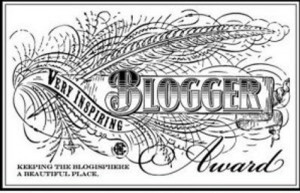 I was nominated for “The Very Inspiring Blogger Award” on Saturday by fellow blogger at The Jenny Mac Blog and I’d like to take this opportunity to thank Chelsea Brown for this award. Thank you very much Chelsea, I truly appreciate this and I am paying it forward now. 4) Nominate 15 other bloggers for this award and link to them. 1) The music that I listen to is as random as my writing. A great mix of multiple genres’. 2) I very rarely remember my dreams, but I always fall asleep thinking about something new to write about. 3) I have two children and raised one of my nieces and treat her as my own. 4) Due to tragedies in my family, I fell into a depression which has actually helped my writing tremendously. 6) One of my brothers committed suicide when I was 18 years old. 7) I am turning 40 in May!!!! YIKES!!! Fiverr – I chose Fiverr because of the amazing people I have met there, not to mention the income!! Prayers for Cheyenne Rae – Cheyenne Rae and her mom, Amy, have inspired me more than I could ever put into words. Joyann8 – Joyce has been a huge inspiration to me on a personal level and we met through my personal blog, My Crazy Family Life. Independence Chick – Another personal inspiration. Damian Trasler’s Secret Blog – Another personal inspiration. Creatrixblood – Claire has inspired me the most as far as continuing with my writing. Thank you Claire!! Terrible Minds – Chuck is an excellent writer and I take all of his tips and tricks very seriously. Imagineer Books – One of my newer inspirations. Coastline Books – Another one of my newer inspirations. Michelle Proulx – Another one of my newer inspirations. Where Have All the Flowers – Another one of my newer inspirations. Oprah – This is probably a no-brainer, but I have been inspired by Oprah since I was a child. Cell War Notebooks – Julie’s amazing story is so heart-felt and inspiring. I am Charm – Charm is an inspiration to everyone that has ever read her blog. Congratulations to all of my nominees!!! Posted on January 20, 2013 by FRaPS: Family, Relationships and Personal Situation. This entry was posted in What's Up and tagged award, awards, blog, blogger, bloggers, crazy family, entertainment, inspiration, inspirational, jenny mac, oscars, pay it forward, personal inspiration, very inspiring bloggers award. Bookmark the permalink. Congratulations.. I’d love to know how to get nominated. This sounds like a great “pay it forward” opportunity! Thank you!! This is the first that I have heard of it, but just keep being awesome and you will be nominated!! FYI, I wanted to let you know I think your blog is so awesome I’ve put it on my recommended links. Keep up the great work. Congrats on the award and thanks for following my blog!! Wow! Awards even for blogs. But why not? Congratulations, Angela. Wow, wow, wow! Thank you!! I was shocked too! !